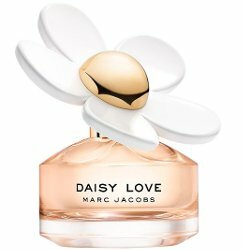 Marc Jacobs has launched Daisy Love, a new flanker (by my count, the 19th) to 2007′s Daisy. Love fills the air with radiant florals and a sparkling gourmand twist crystallized berries mingle with the sunny petals of a daisy, driftwood, and cashmere musks. The notes feature strawberry, violet leaves and petals, jasmine, musk and vanilla. Marc Jacobs Daisy Love is available now at Herbergers, in 50 and 100 ml Eau de Toilette. I really tried to wear the original Daisy, when it first came out, but it just wasn’t for me. I do like the forever dream one, well enough. I just wonder, do they really make that much profit on these flankers? I would think MJ could have just left the original to stand on it’s own as a future classic. Since a lot of people wear it as a signature scent. I think he has done it a disservice. I bet Marc Jacobs is makin’ gazillons! Lots of people collect the bottles, so they buy every single one…..
That’s true, and thinking that way, I have purchased my share of Alien Flankers, but only if I liked the perfume. I just wonder how original Daisy sales hold up with so many new releases in such a short time? I think the profit margin is huge. You know I have a soft spot for original Daisy, but the flankers haven’t suited me at all. I guess people do buy them anyway. I hate to say ditto because I did not try enough of the flankers to say!